snow « "I do wander everywhere"
After three days based at the fantastic Aurum Lodge near Nordegg, Alberta, we headed for Banff National Park and the continuation of our drive west. It was snowing when we got up but, hey, it’s only May, in Canada, and we’re hardy. 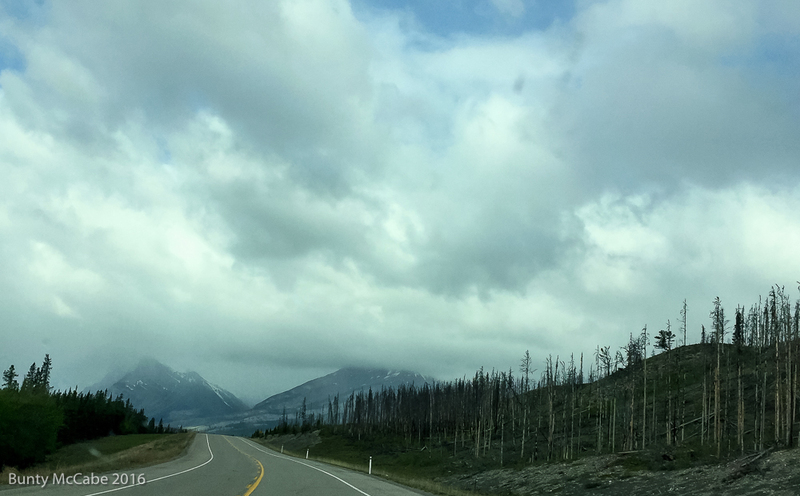 These photos are all from the western end of the David Thompson Highway and were taken with my iPhone through the car window while Mr. IDWE was driving. 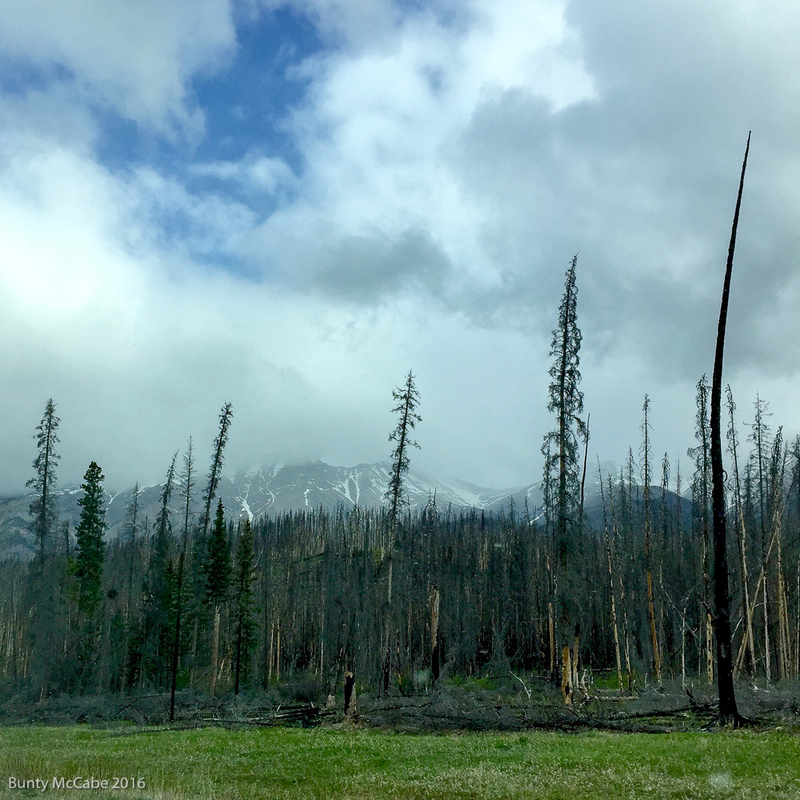 The forest fire here had burned several years before but we were all very aware of the tremendous damage that had befallen Fort McMurray, Alberta, earlier in the month. 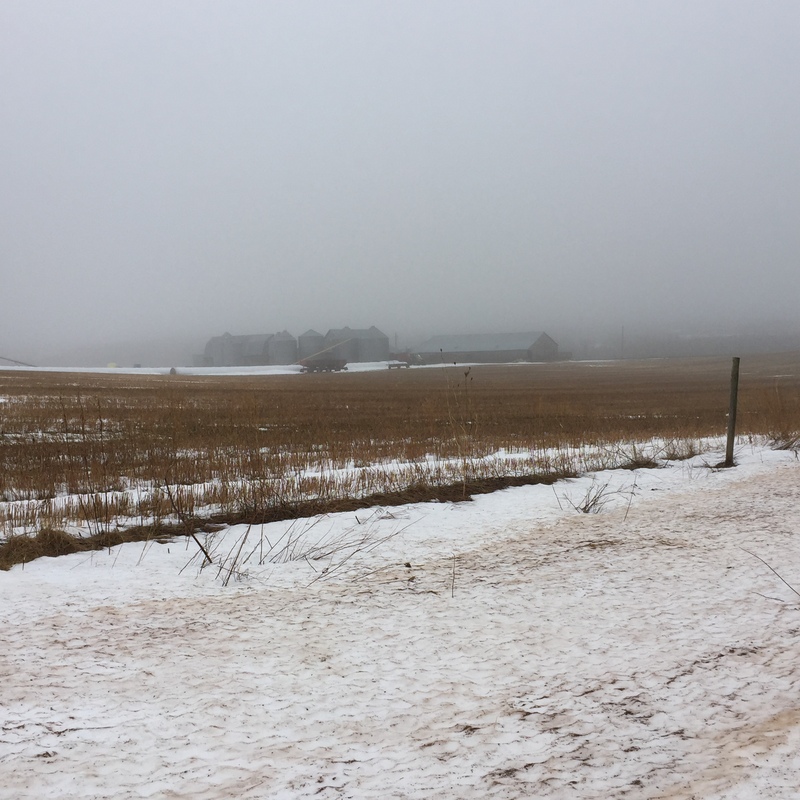 The snow continued until noon but the day remained gray and overcast. 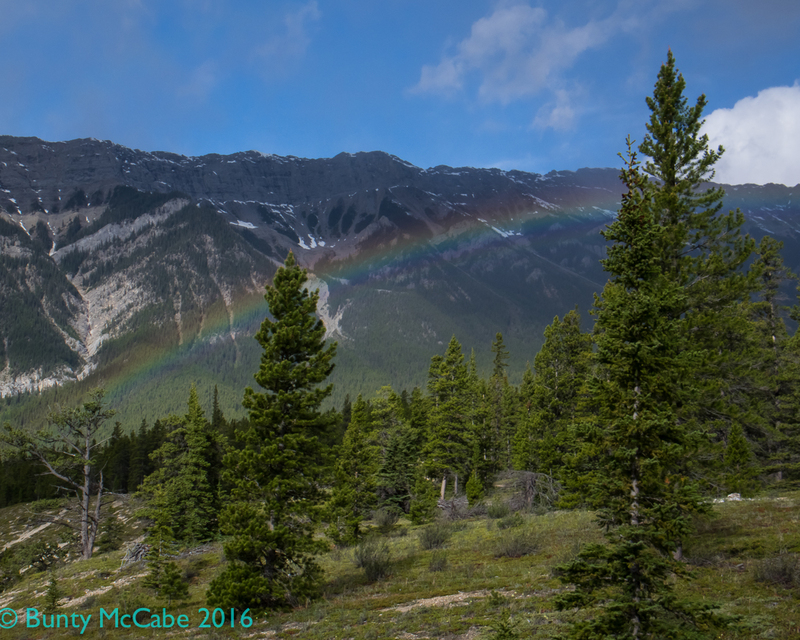 Before we left Aurum Lodge, while we were exploring the edges of Abraham Lake, we turned to the west and were treated to a rainbow! 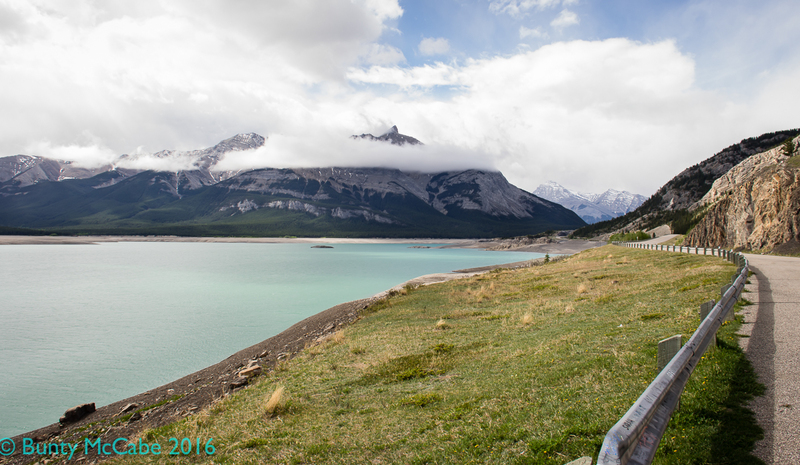 As we headed north along the David Thompson Highway towards Nordegg and Crescent Falls (next post) we stopped to look at Mount Michener. 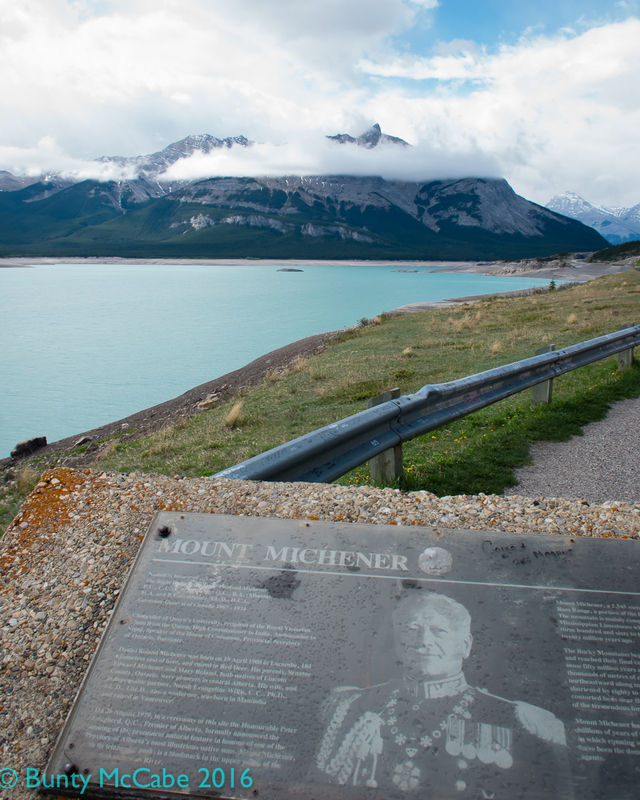 Mount Michener is named after Canada’s 20th Governor General, Roland Michener, who served from 1967 to 1974. It’s been a mild winter. I woke today to the sense that the world was brighter. It was. Snow fell overnight and heavily at times this morning. We have a saying here: “Big snow: little snow; little snow: big snow.” We were getting big snow(flakes) so, if the saying were true, it wasn’t going to amount to much. It didn’t. Do you have that saying where you live? On Monday, the second day of spring, we are forecast to get “little snow” and perhaps our most significant snowfall this ‘winter.’ Stay tuned. Posted for iPhriday coordinated by the lovely blogger at Gray Days and Coffee. Confession: I didn’t even leave the house to take these photos with my iPhone 6 using Huemore. 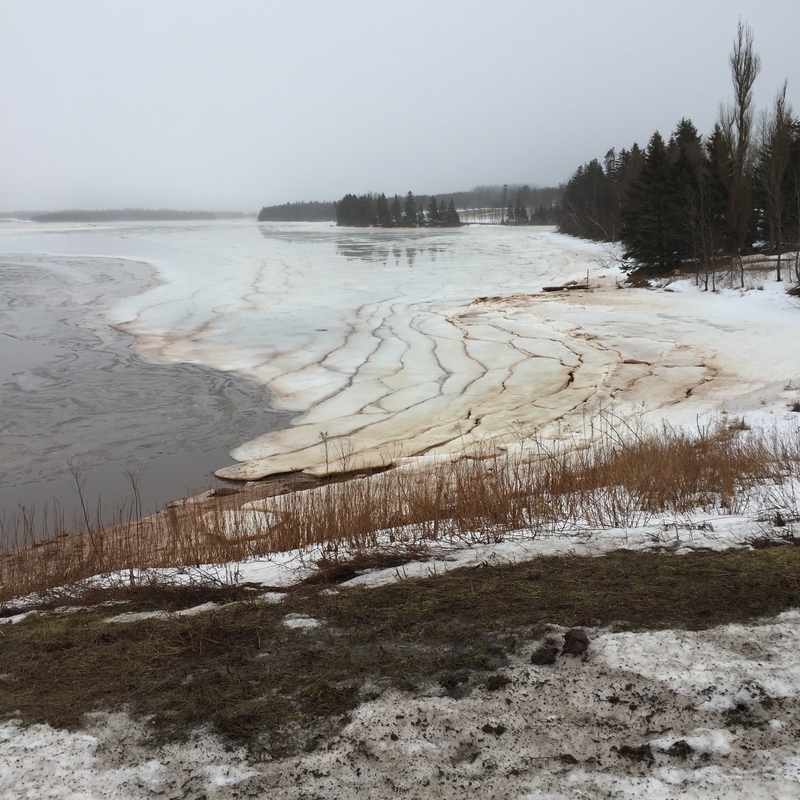 This first photo looks upriver past our shoreline at the right and includes open water, ice breaking in lines parallel to the shore, and water over ice in the background. During a real winter the “pond” on the right freezes and pick-up hockey games have been held on it. But the last time I saw one of those was at least 10 years ago. The pond drains away in spring and all but its bottom is planted with whatever is grown in that field in that summer. Mr. IDWE in the yellow slicker. 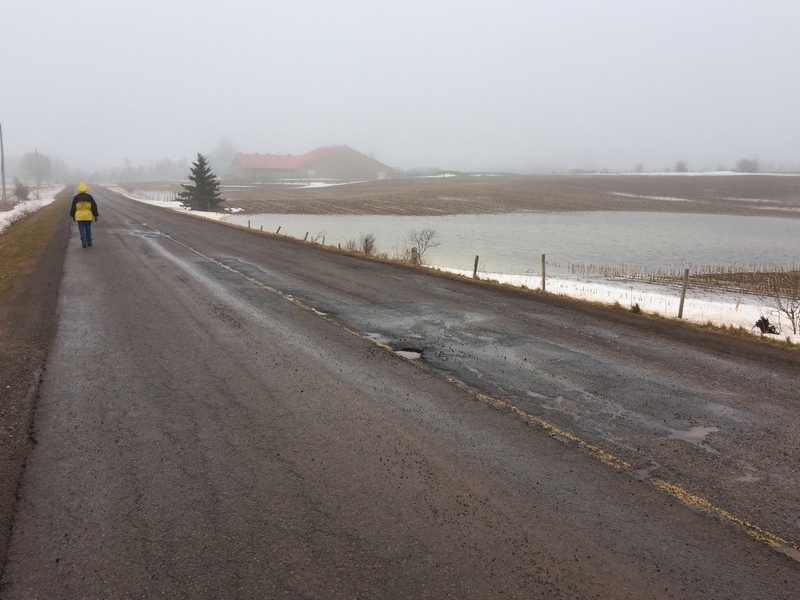 Farm buildings obscured by the weather. Shot Wednesday, February 17, for iPhriday on Feb 19 with an iPhone 6 and quickly uploaded before I headed to the airport to catch a flight to Cuba. WordPress was totally uncooperative; the pictures weren’t visible in the media library or in the draft, so I had to abandon the post. I’m back now and the photos did eventually finish uploading so here it is, one week late. 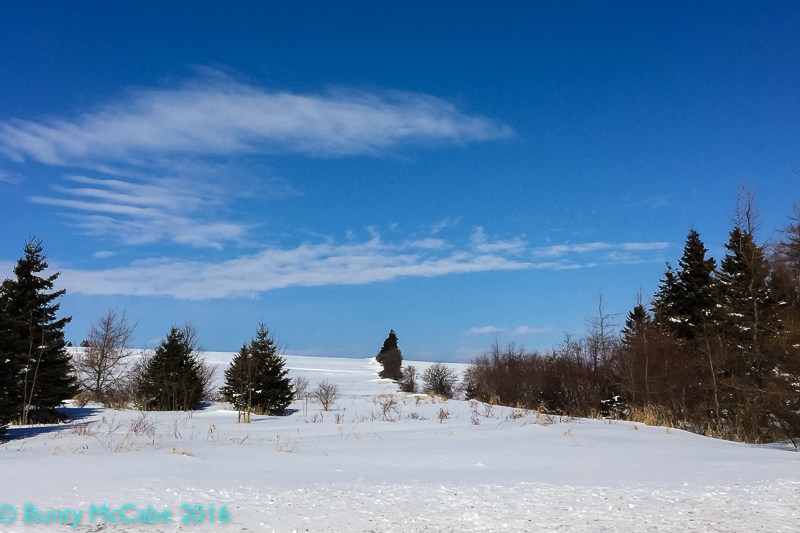 As you drive along the shore road between the Town of Stratford and my home, 20 km away, the Pownal Escarpment is the rise of land to the north. In the next photo you can see a snowmobile trail crossing from one field to the next parallel to the top of the slope. It’s not a very impressive escarpment compared with the Great Rift Valley or the Niagara Escarpment over which Niagara Falls tumbles. An escarpment is simply a steep slope or long cliff that occurs from faulting, tilting or warping and separates two relatively level areas of differing elevations. All the slopes have been farmed for more than a century, some just up to the point where it became too steep, and where trees remain. Over the past 40 years several impressive and very expensive houses have been built at the top of the slope. 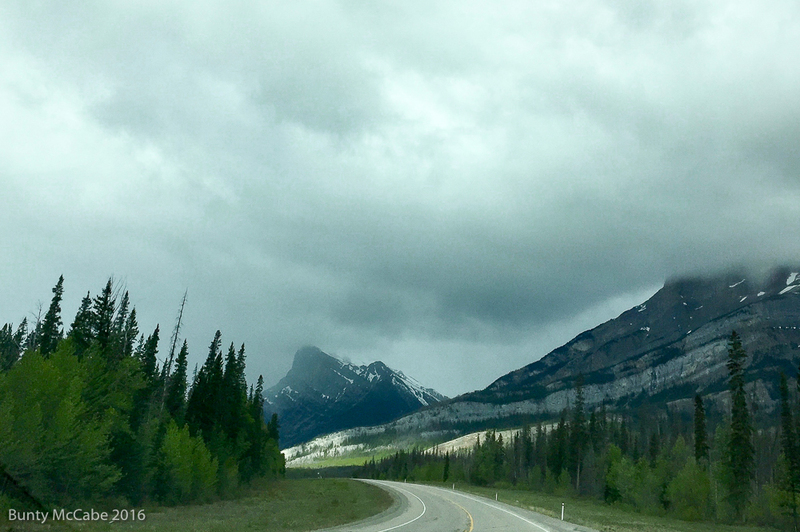 The pictures were taken with an iPhone 6 from my (stopped) car as I was driving back from iPhriday grocery shopping. I stopped about four times to take photos and not once did a car pass me on the whole drive! 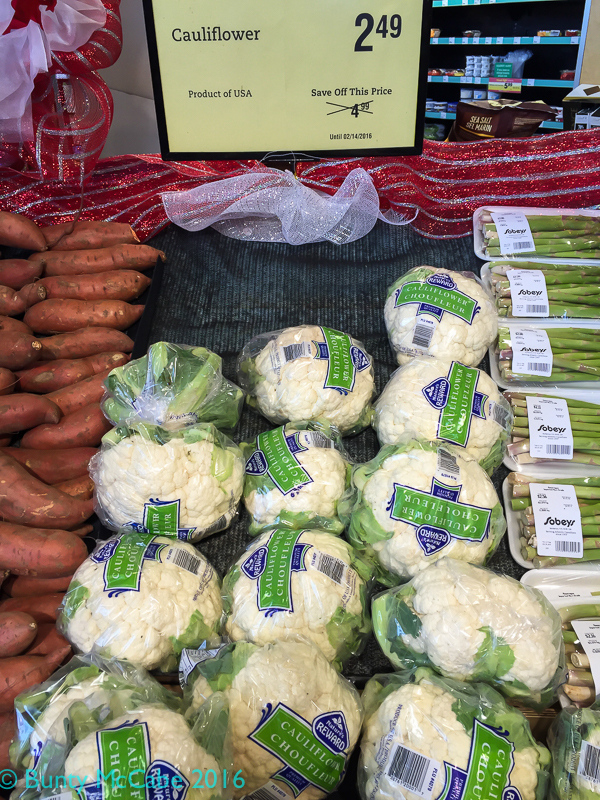 For those of you who follow my blog, you will remember CauliPhlower from a couple of weeks ago. The price has gone down significantly. They could just as easily have put 6.99 under the x-ed out price! Posted for iPhriday a brainchild of Gray Days and Coffee, who posts lovely photos all the time,whether with her iPhone or something more substantial! 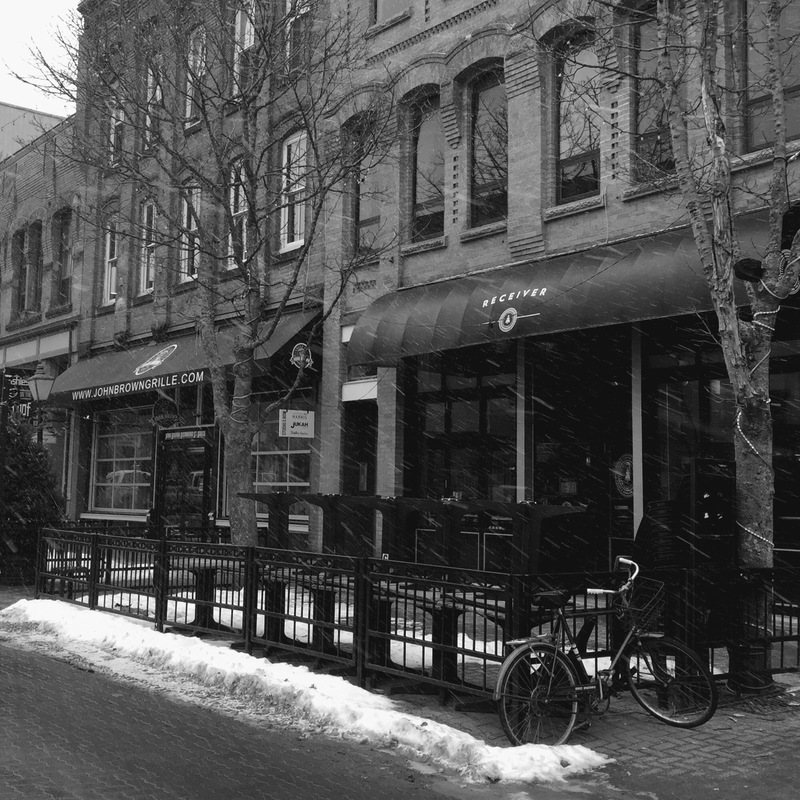 Victoria Row: a pedestrian street in the warmer months. I was in Charlottetown doing errands when the predicted snow began. The iPhone has just the right shutter speed for catching snowflakes. These eateries are just around the corner from the Connolly Block, below. I remembered a story from my work days 30 years ago. 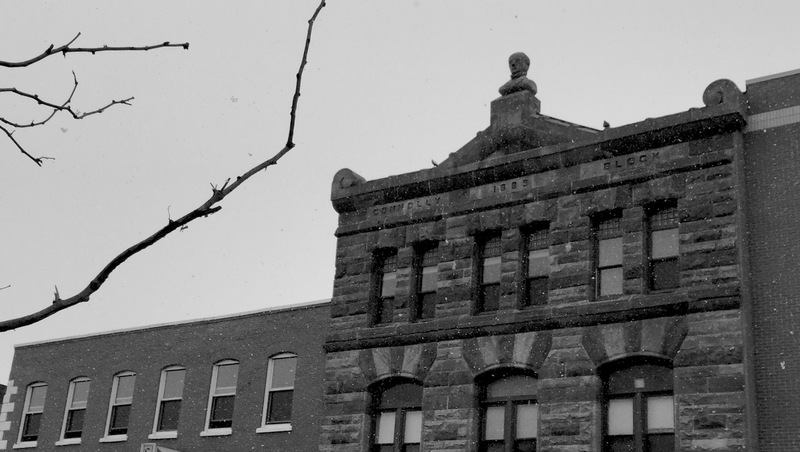 The man charged with deciding whether the weather was bad enough to close our department had a view of the top of the Connolly Block from his office. When he couldn’t see Mr. Connolly’s head anymore – either because the visibility was down to zero or his head was enveloped in snow – he sent us home. After driving home, and lunch, I went for a walk in our yard with two cameras, my Pentax and my iPhone. 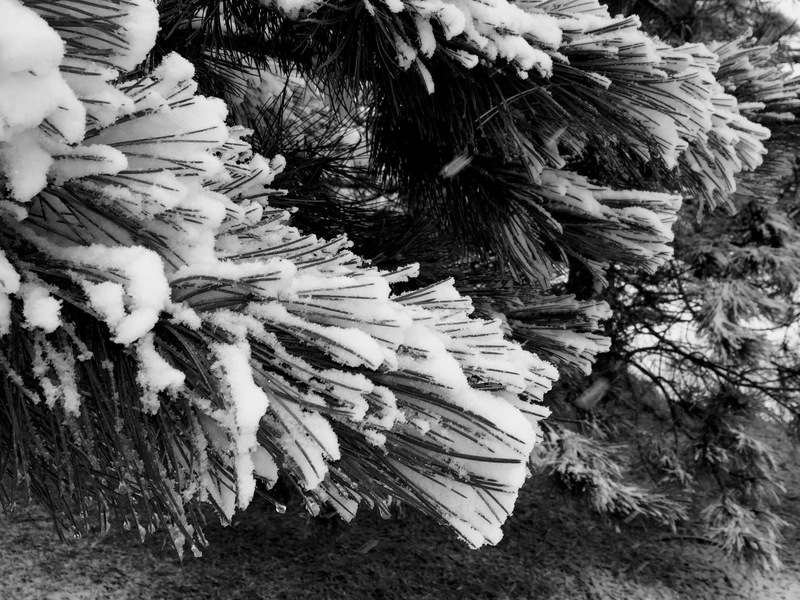 Austrian Pine with wet snow three hours later. Since these are posted for iPhriday, I am only showing the iPhone ones: shot with Hueless and edited in Photos on the iPhone. I’ll probably post a couple from the Pentax later this weekend. 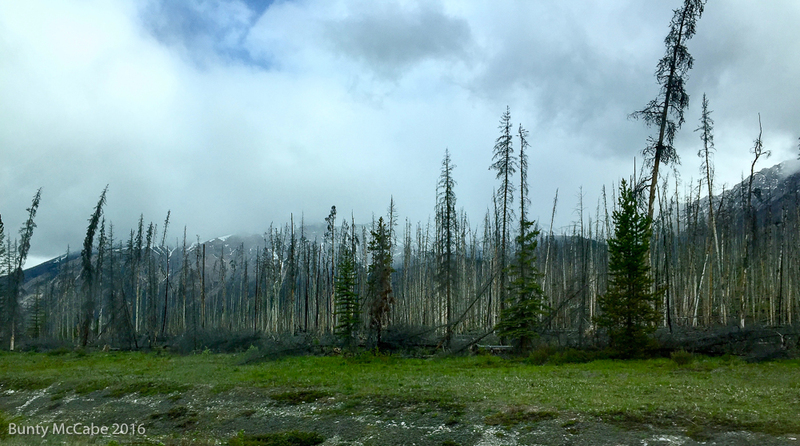 Vernon Bridge + three hours – white spruce. 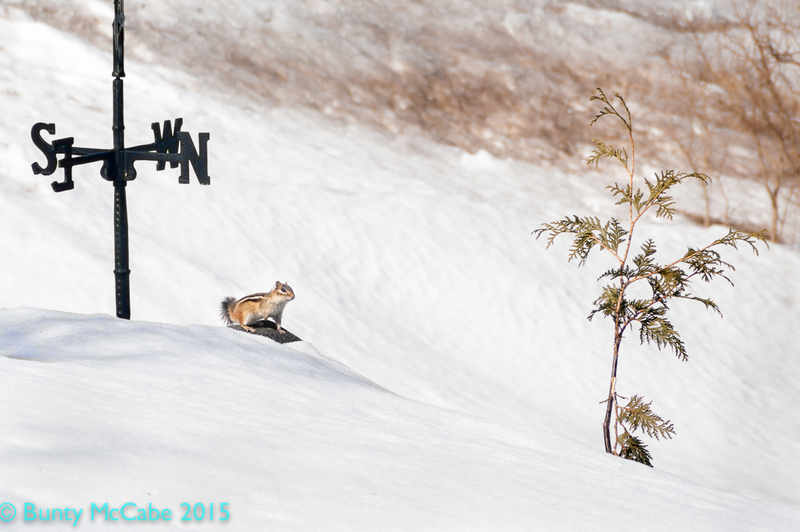 On April 9 of last year – 2015 – this chipmunk emerged – probably from our garden shed – optimistic about spring. The stand for the weather vane on which the chipmunk is sitting is a meter (3 feet and some) off the ground and the snow is the cumulative result of two months of blizzards and storms. This post is dedicated to all those in the eastern USA who were snowed under and snowed in this weekend. I am thankful that the storm went offshore before it reached PEI. Boundless optimism from other WordPress folks can be found here. Photo taken from inside the house with a Pentax K20D and a 200 (300 equivalent) mm Tamron lens at 1/90 sec at f/13 andISO 200.